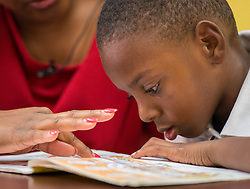 Neil Bush, chairman of the Barbara Bush Houston Literacy Foundation and a Read Houston Read volunteer, said he plays games, including an educational version of Tic-Tac-Toe, with his assigned student, Savannah. They also go through digital flash cards and read a book each session. “There’s no doubt that the intervention of a loving adult, a caring human being, in the life of a child has to make a difference,” Bush said. Bush said he can see Savannah’s progress each week, and so can she and her teacher. He said it’s exciting for everyone involved to see how many new words she learns each week. All volunteers go through a background check and a training session, which is completely online. Volunteers are assigned a classroom and are then able to schedule sessions, which they can reschedule later if there ends up being a conflict with their work schedule. When the volunteer is ready for a scheduled station, he or she logs into the tutoring program and calls a student’s classroom. The district needs volunteers for the online program, but there are also opportunities for face-to-face tutoring at 40 schools. The online program is facilitated and funded by Innovations for Learning. For more information, and to register to volunteer, visit ReadHoustonRead.com.